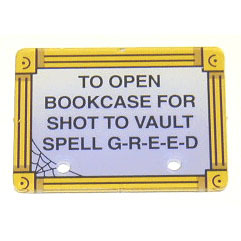 New replacement sign plastic for bookcase on regular Addams Family and Addams Family Gold games. Attaches with rivets or nuts/screws to bookcase lid # 03-8621. Replaces Bally part #31-1664-25. Often broken or missing on many used games.